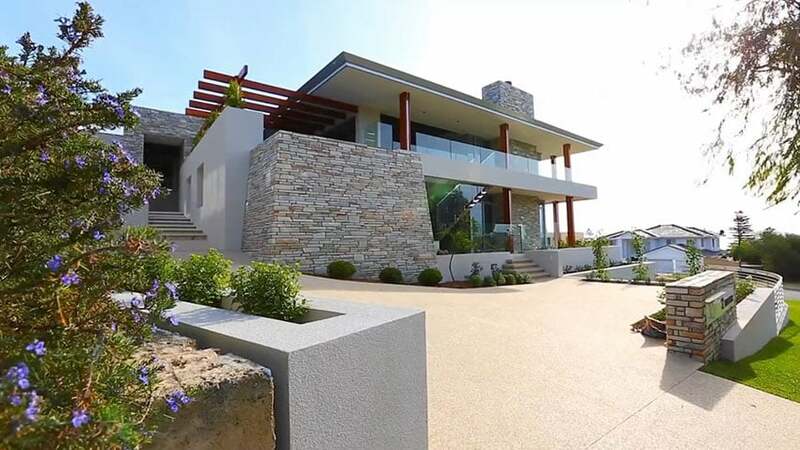 This modern house design showcases interior and exterior pictures of this multi-million dollar home. 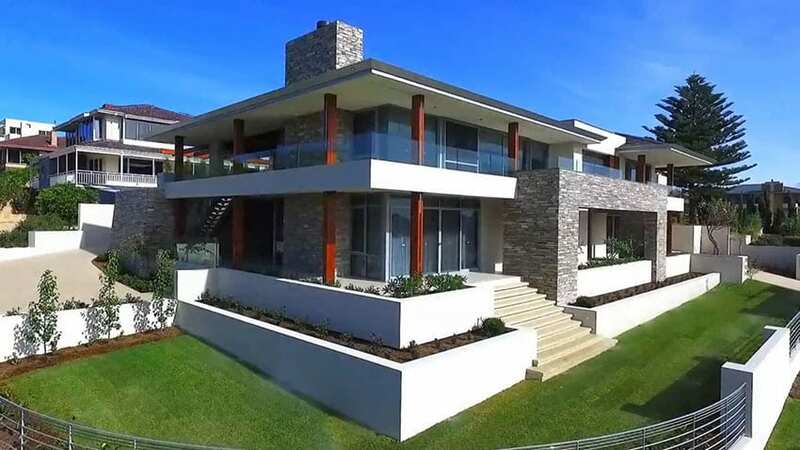 The home’s floorplan offers 3 bedrooms and 3 bathrooms with beautiful architectural design and high end furnishings. 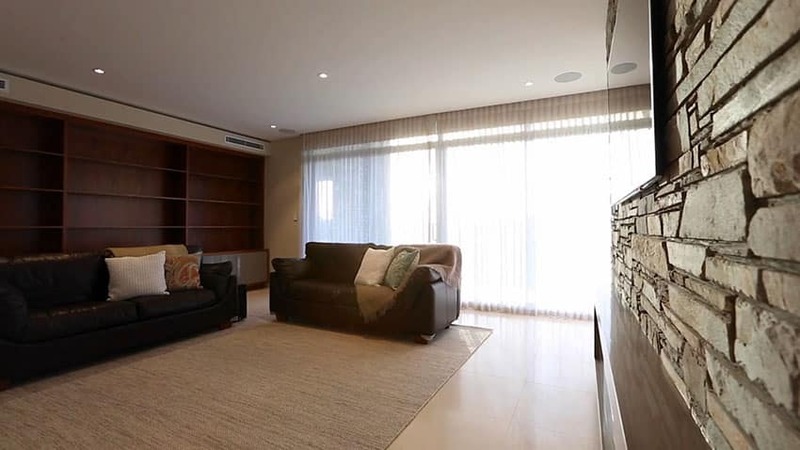 An open plan kitchen faces the dining area and flows through to a living room making it perfect for entertaining. 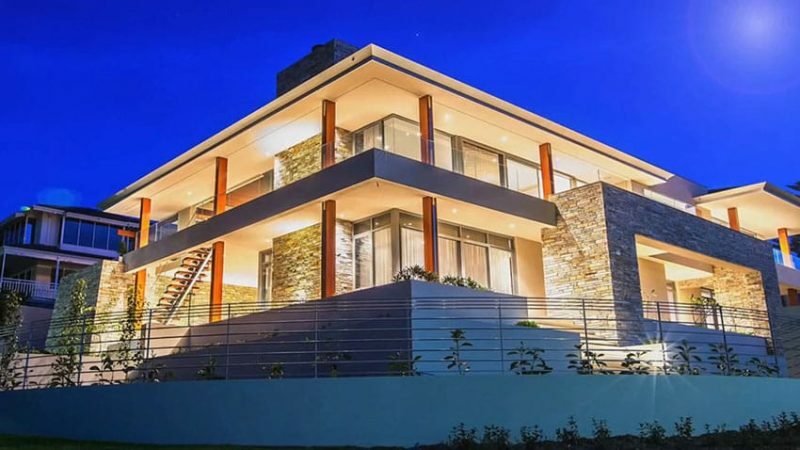 The modern home also features an amazing ocean view with plenty of windows, a wrap-around balcony and outdoor patio complete with swimming pool. 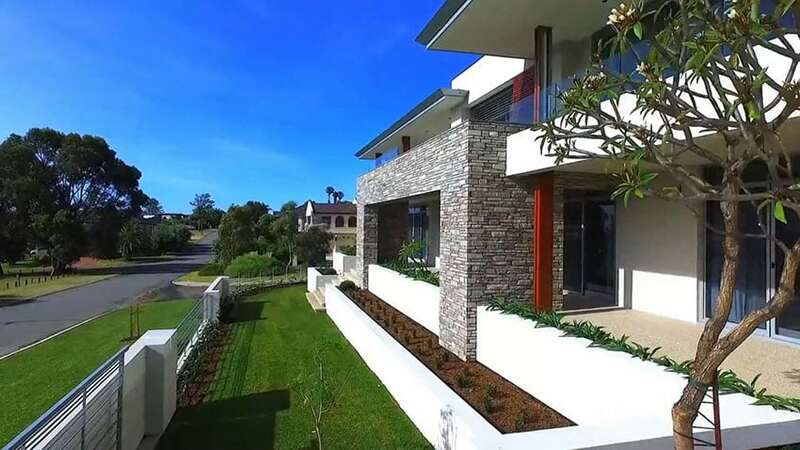 Take a look as we walk you through each area of the house so you can appreciate the intricate level of detail of this luxury home. 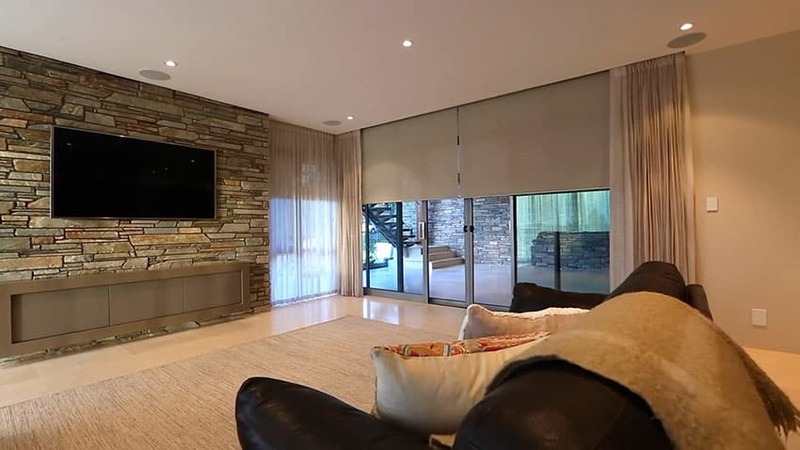 The exterior of the modern home with stone walls, large picture windows and red painted beams. 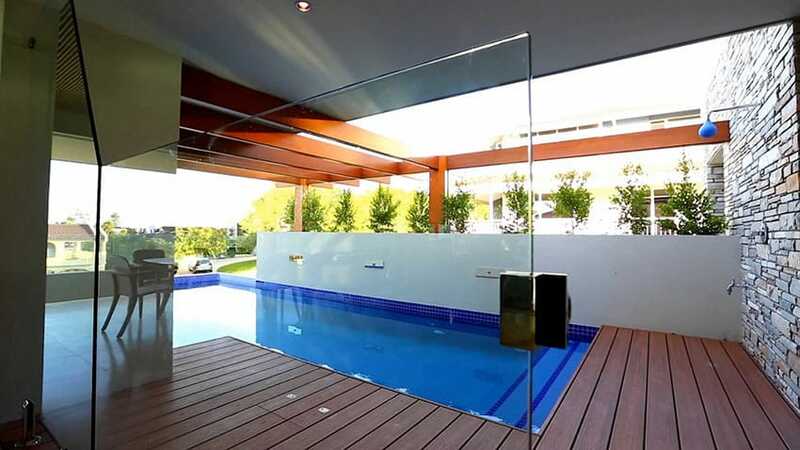 A curved metal railing frames the lawn area and multiple level retaining walls match the home’s aesthetic. The driveway up to the home has steps to the entryway from two separate areas. From this angle a stone fireplace and the top of the patio area can be seen. Side yard of the home with plenty of room on multiple patios for enjoying the outdoor areas. 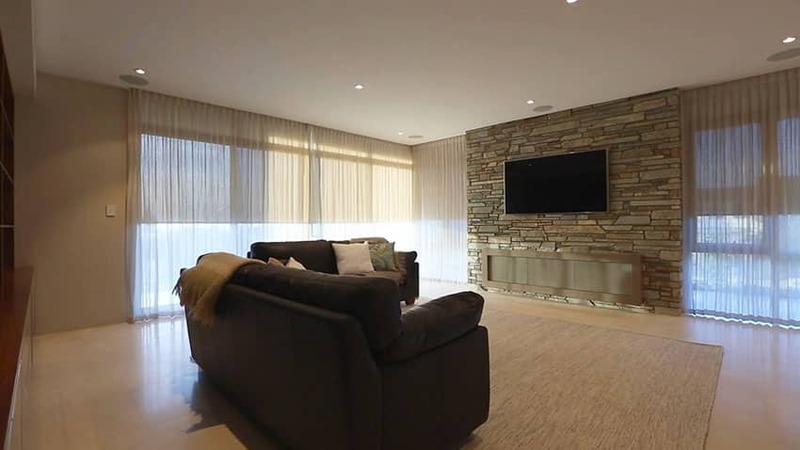 This modern living room features a fireplace with a stacked stone accent wall and windows on all sides to enjoy the amazing views from the home. 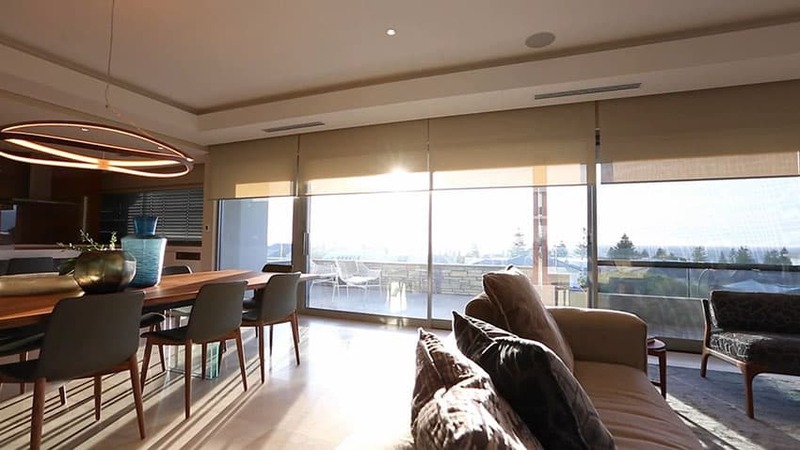 A different perspective of the living room with a water facing window view and an open flow in to the dining area and modern kitchen. 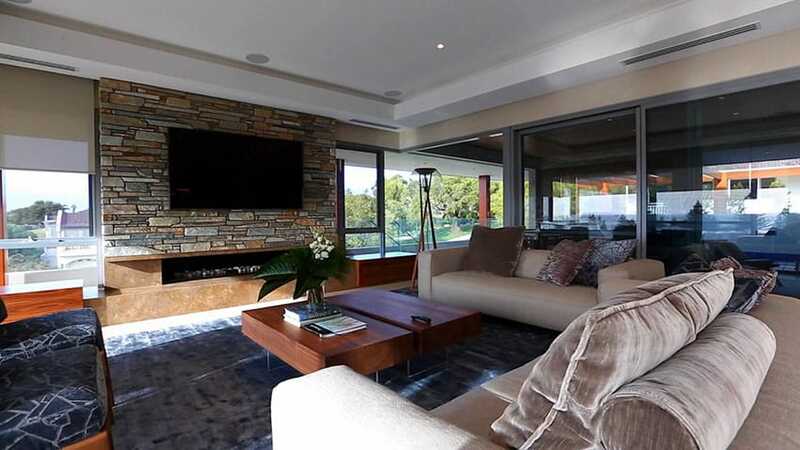 In this picture you can see the detailed tray ceiling as well as the large sliding glass door. 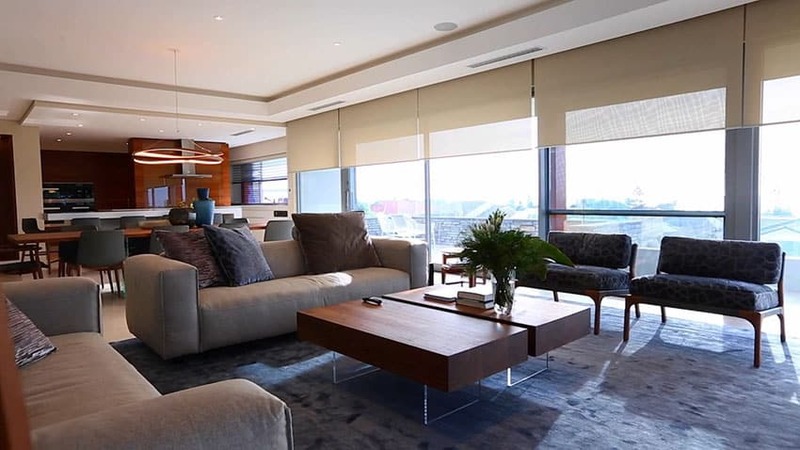 The modern house design interior is equipped with automatic shades to control the lighting and amount of sunlight that is filtered in. 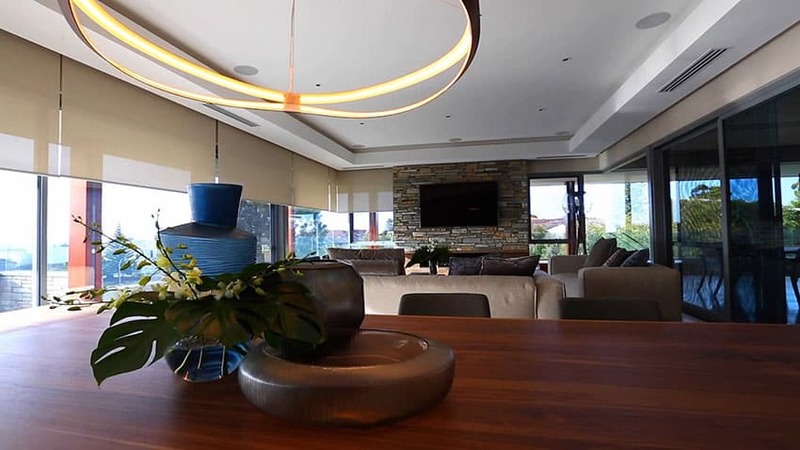 A view from the dining area to the living room with a modern light fixture. 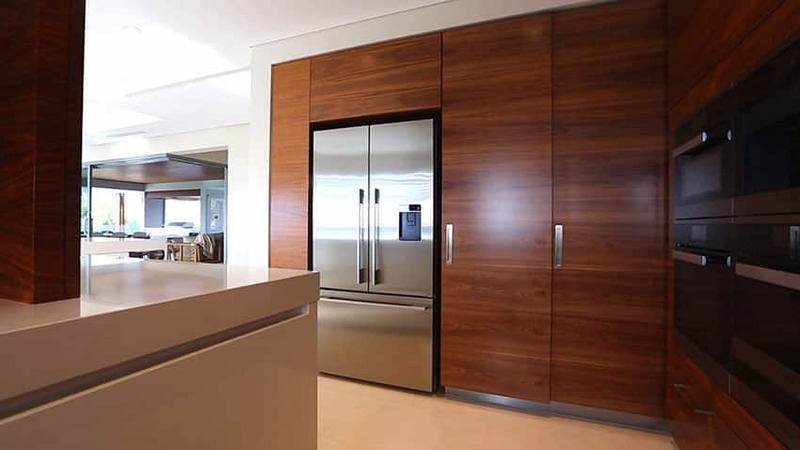 From this view of the modern kitchen design you can see the two tone cabinetry of brown and white with its high polished flush surface and geometric design. 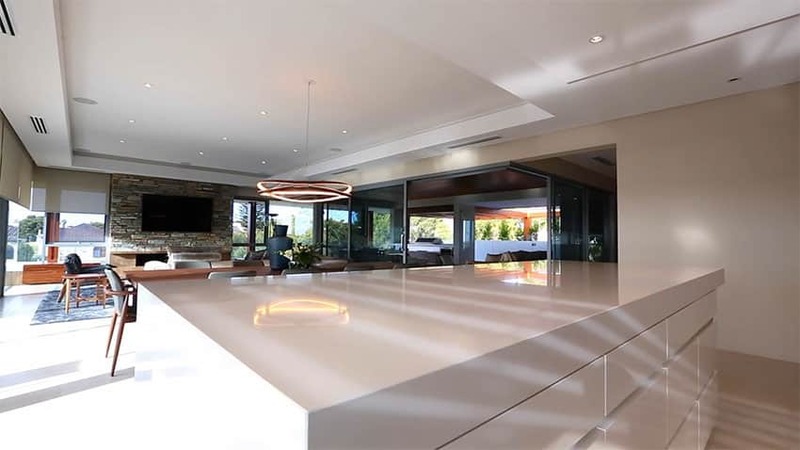 A view of the modern kitchen island with flush cabinets providing the space with a sleek and stylish look. 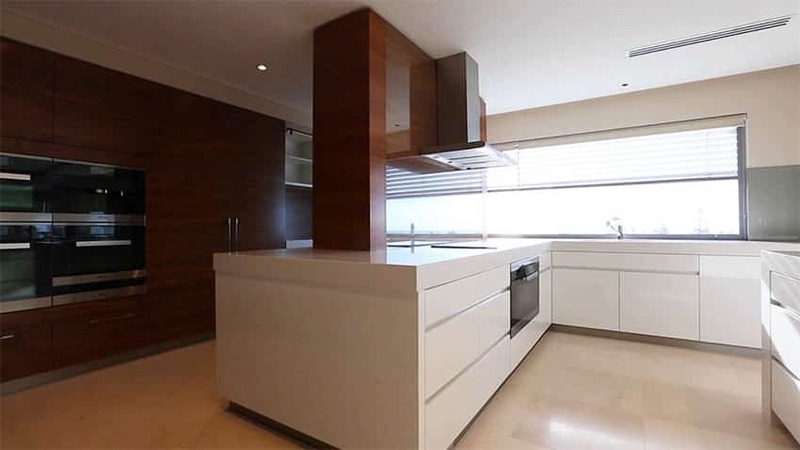 This view from inside the kitchen showcases the large floor to ceiling pantry, stainless steel refrigerator and multiple ovens and microwave units. 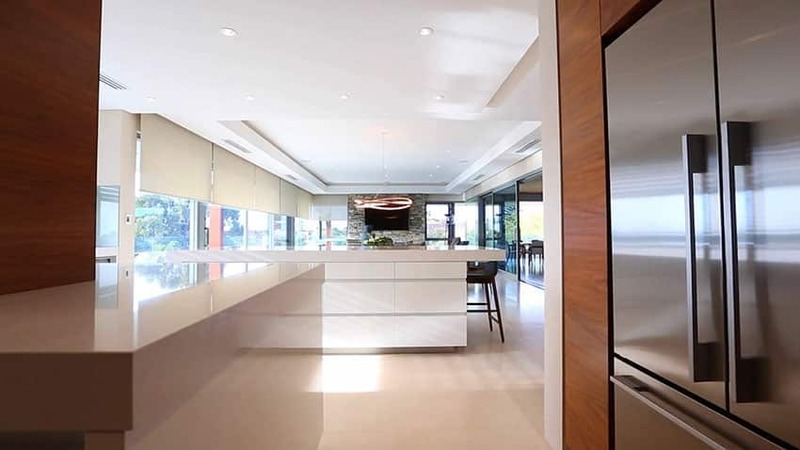 Here is another perspective of the modern kitchen looking in to the living room area. 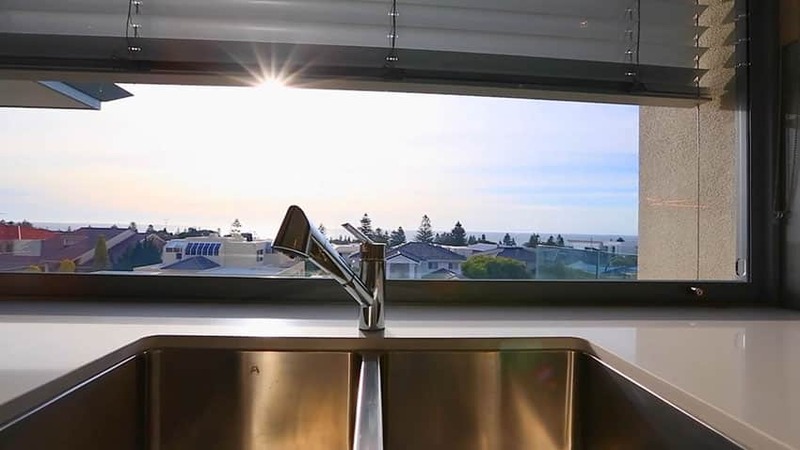 Prepare your food in style while enjoying the beautiful ocean view from the kitchen sink. 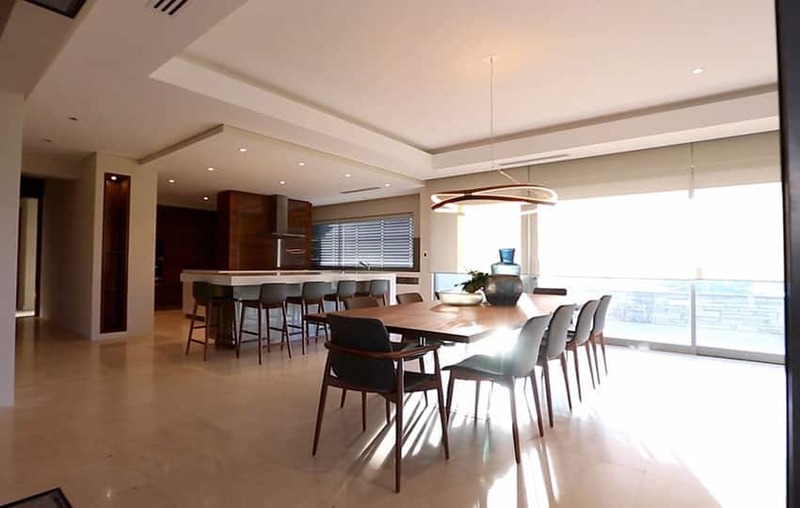 Modern dining room with tray ceiling, and breakfast bar island. 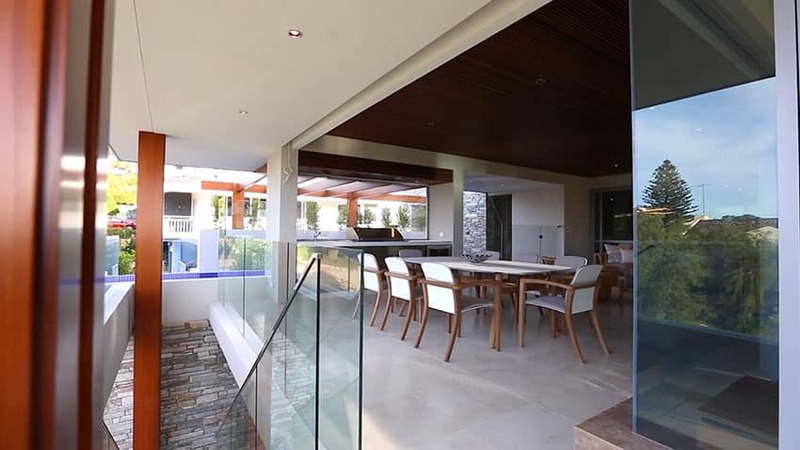 Another view of the dining area with a sliding door to one of the many outdoor balcony spaces in this home. 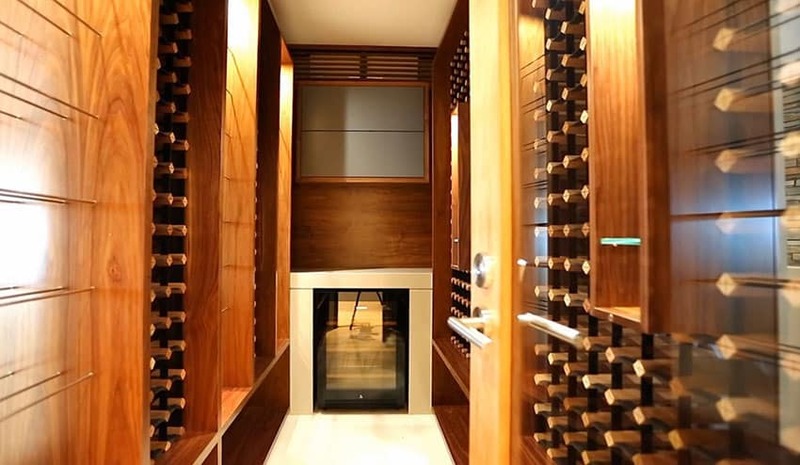 Large insulated walk-in wine cellar with room for hundreds of wine bottles and a beverage refrigerator. 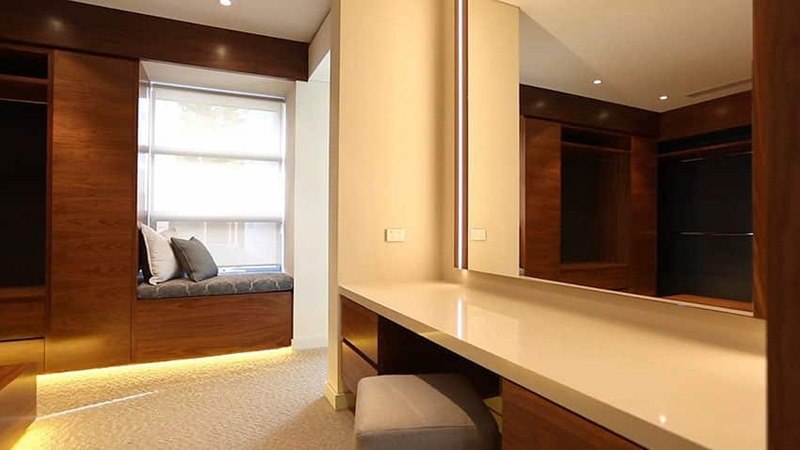 Modern master bedroom with raised ceiling and sliding door that opens to an outdoor patio. 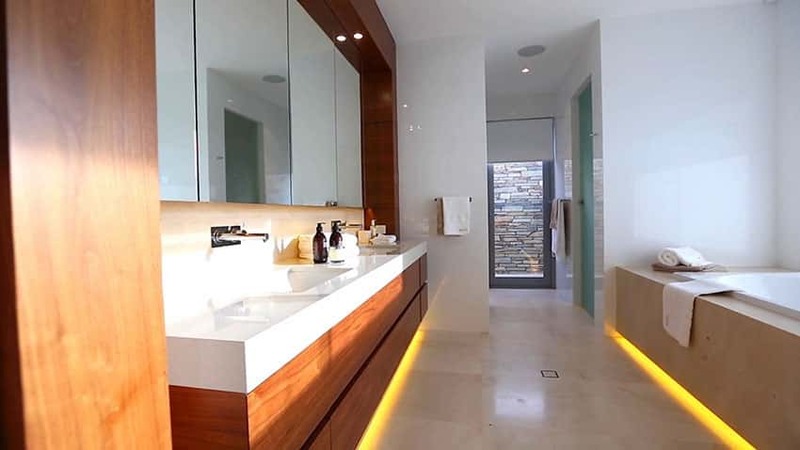 Modern master bathroom with dual sink vanity, a large soaking bathtub with under-mount lighting. 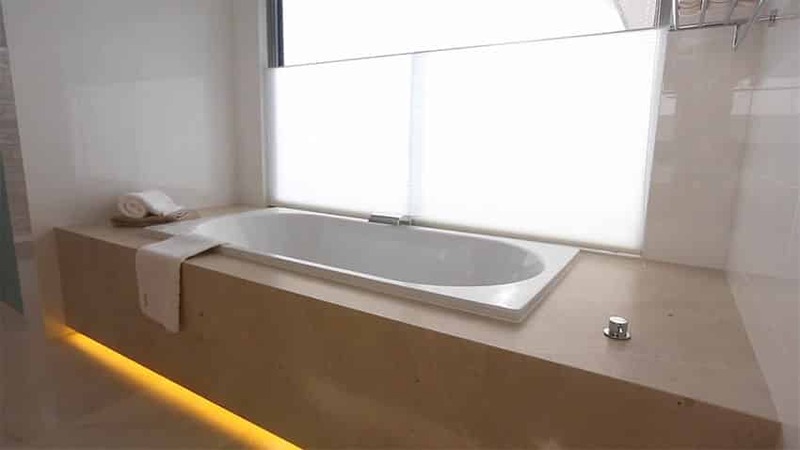 A view of the bathtub enclosure with a lot of natural light as well as under tub lighting. 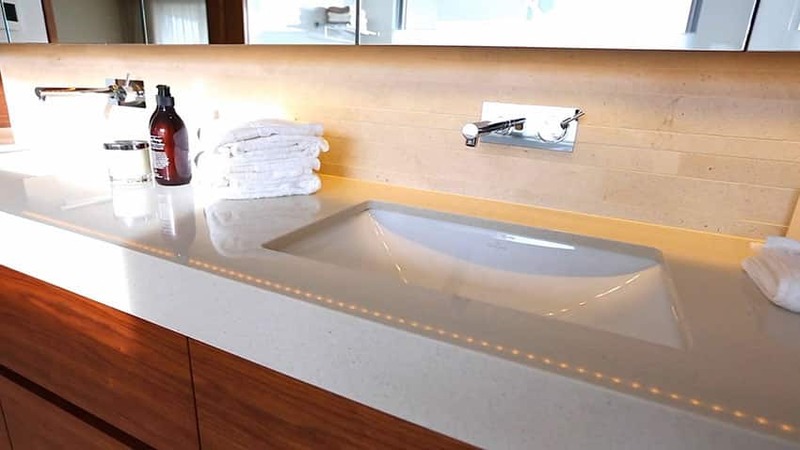 A closeup of the dual bathroom sinks and the details of the vanity cabinet and backsplash tile work. Opening from the master bathroom is this makeup area that is also part of the large walk in closet. 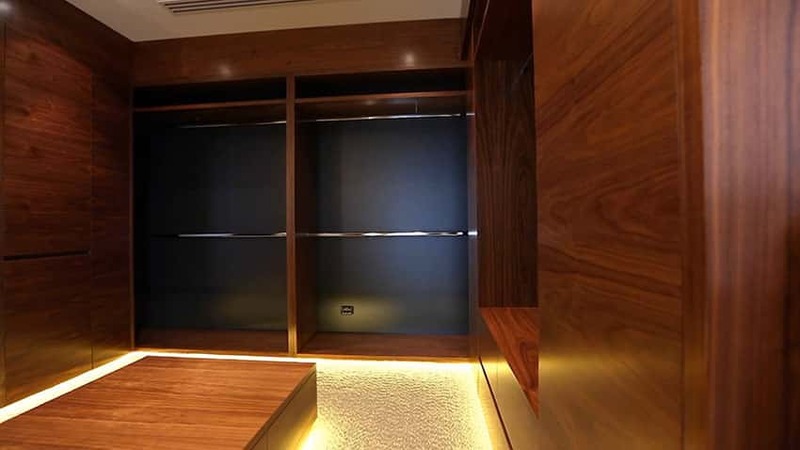 The large walk-in closet is stylish with its wood laminate island and under cabinet lighting. 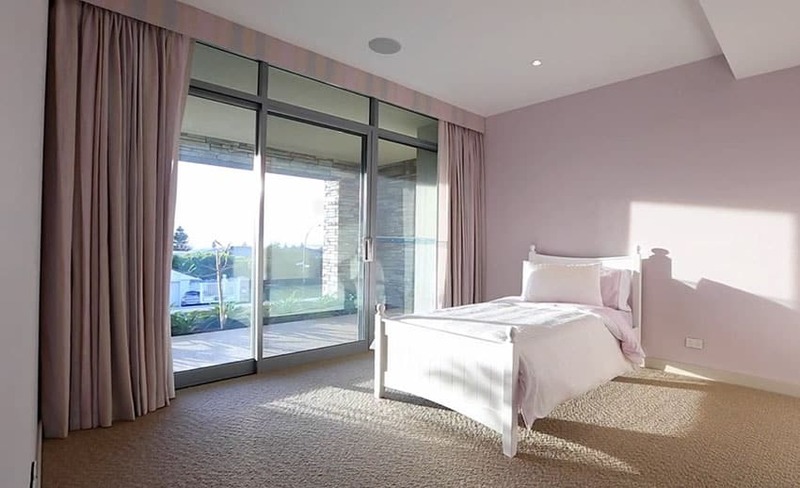 This girls bedroom is decorated in a soft lavender color with white twin bed, floor to ceiling drapery and Berber carpet. 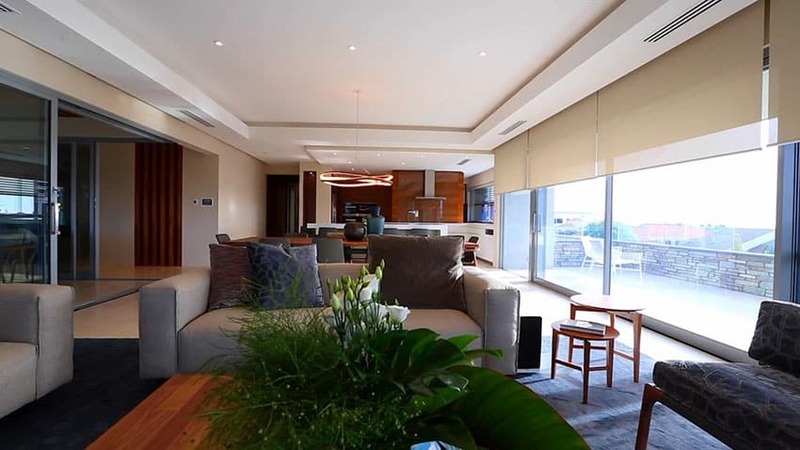 This room is designed to be a movie room with plenty of comfortable furniture and ample room for guests. Another perspective of the family room with a view of a covered bottom floor outdoor patio. View of the built-in bookshelves and closeup of the stacked stone wall. 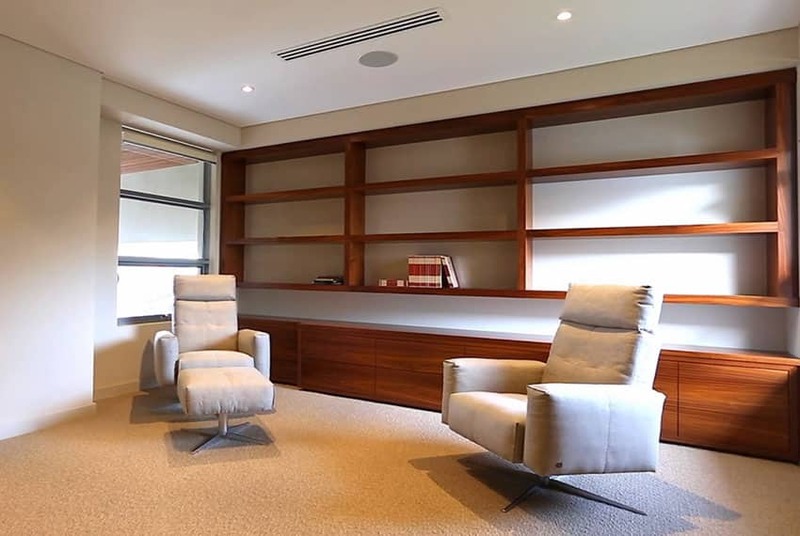 This modern house design interior space is set up as a reading room with two comfortable modern lounge chairs and a large wood bookcase. An ultra-modern laundry room is equipped with plenty of storage and room to fold clothes on the large counter surface. 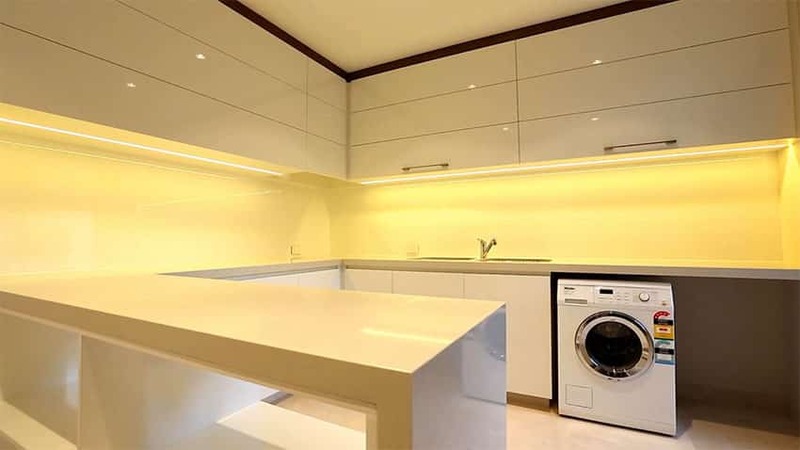 Under cabinet lighting gives this laundry room a bright modern design. 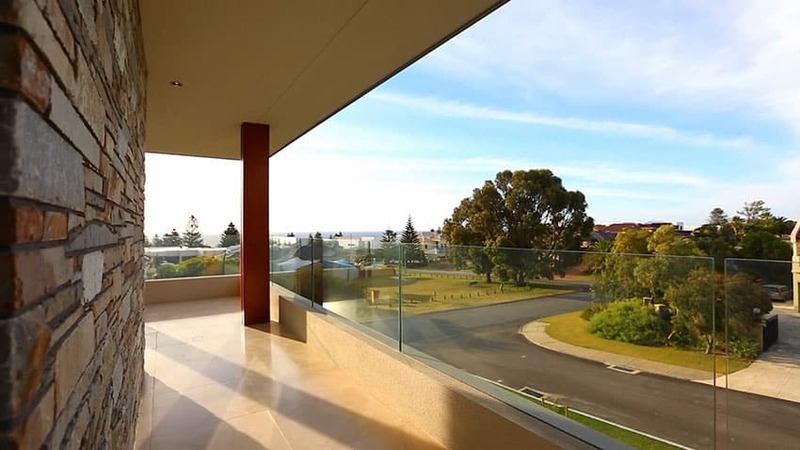 From this view you can see the wrap around balcony that’s equipped with glass railing to maximize the water views. 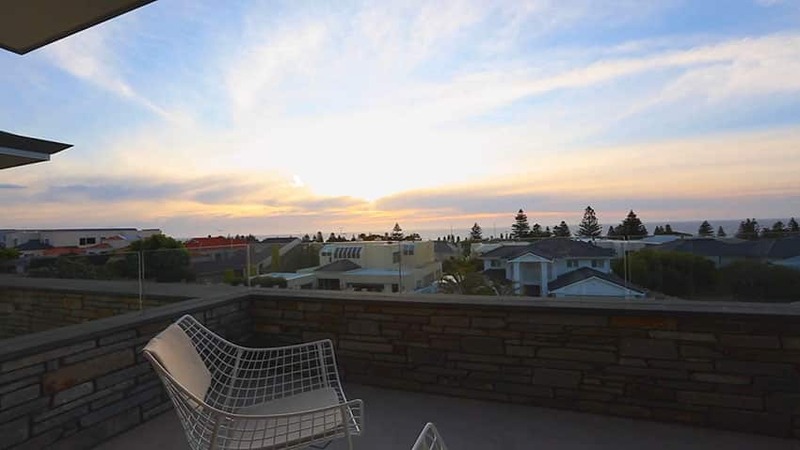 Gorgeous patio view of the ocean with modern wire furniture and stylish stone walls with glass railings. This outdoor patio allows you to entertain, barbecue from the outdoor kitchen area and eat at the dining table that can accommodate 8 people. 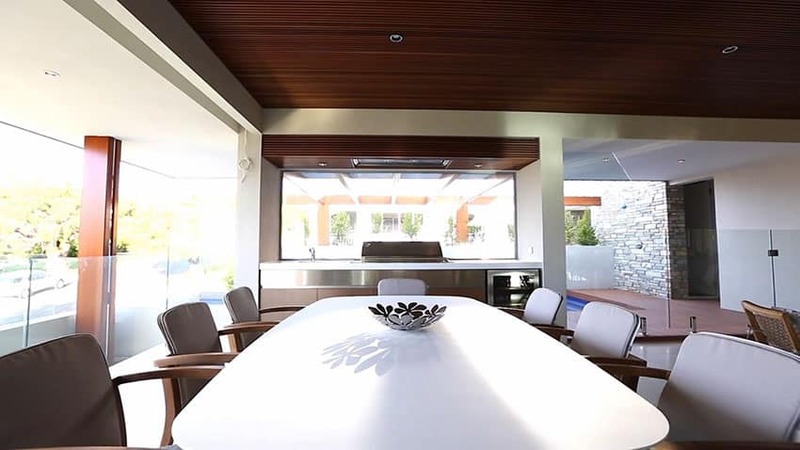 A direct view of the outdoor dining table looking on to the outdoor kitchen. From this patio vantage point you can see the swimming pool while relaxing on one of the many furniture pieces found in this modern property. 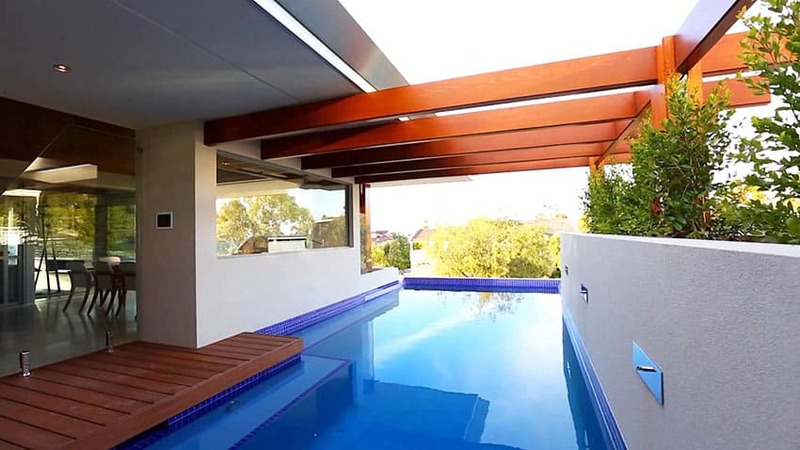 The swimming pool is surrounded by blue tile and a wide plank stained deck with stacked stone wall. 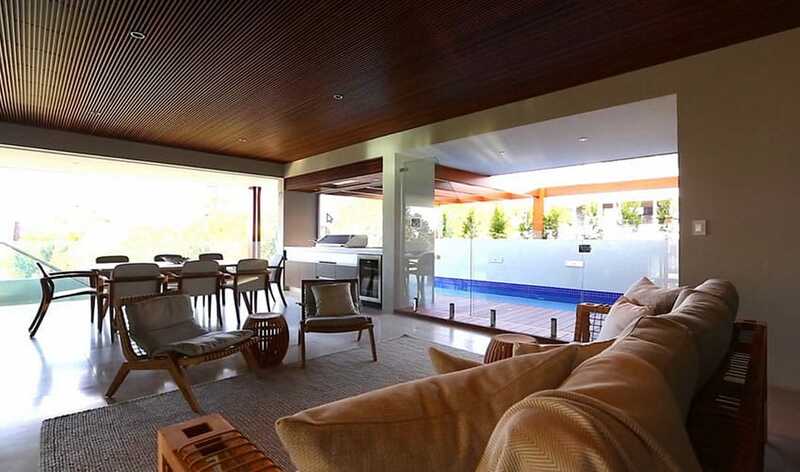 The gorgeous swimming pool is both indoors and outdoors and features an exposed beam pergola and privacy walls. 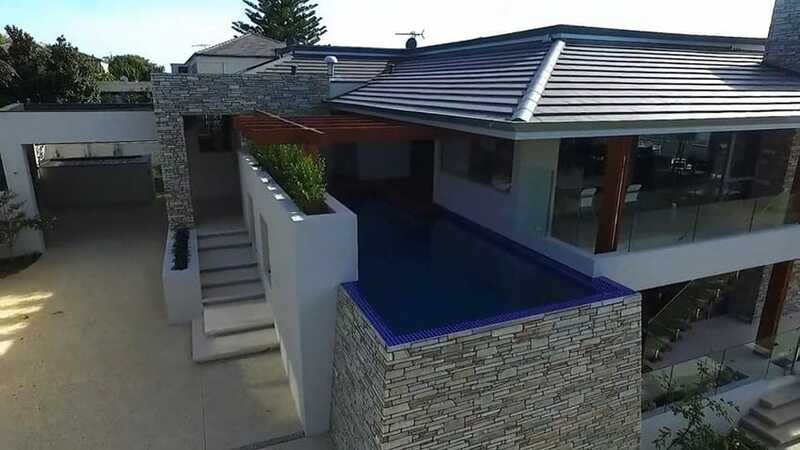 An exterior view of the modern home and elevated swimming pool area.